CFGA does not have a physical kennel. All our adoptable greyhounds stay with our foster families until their perfect furever home has been found, usually for about two-three weeks. Foster homes facilitate the transition from racing kennel to home life, and teaches the greyhound all about this new world. 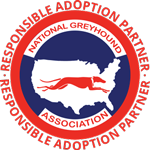 While in foster care, CFGA learns more about the greyhound’s likes, needs, and dislikes, personality and quirks, which are key to finding the right home for them – and the right greyhound for you! Do I need to provide my own supplies for fostering? CFGA will provide you with many of the necessities for fostering (crate, coat, collar, leash), but we do ask that you provide soft dog bedding, bowls, treats and toys. How long will I have my foster for? CFGA tries to limit the time in foster care to two-three weeks. We only bring in greyhounds when we have expected suitable matches. This helps to keep our foster homes fresh, and also not *too* attached! Yes. Greyhounds are used to being crated while at the track. With all the change going on in their lives, we want to minimize as much disruption as possible. A crate is the greyhound’s safe place – somewhere familiar to them, and something they can call their own. A crate is also a useful tool to separate your resident animals from your foster when necessary, and keeps your foster safe when you are not home and keeps them out of trouble. What are my expectations as a foster? As foster parents, we expect you to treat your foster as you would your ‘own’ dog. Foster parents are expected to provide a safe, comfortable and healthy environment for their foster dog. What if I don’t like my foster dog’s name? Greyhounds are provided with a call name soon after birth. This is their identity. Your foster knows their call name, and we kindly request that you use this name at all times. A new name amongst this new world can be very confusing for a greyhound – and we don’t want that! What if my foster needs medical attention? If your foster requires immediate medical attention for a life-threatening situation, seek medical attention immediately and contact CFGA as soon as possible. Otherwise, please contact the Foster Coordination Team and can give you advice or set up an appointment with one of our partnering veterinarian offices, who have sound greyhound experience, and are kind enough to discount their services to CFGA – which in turn helps us keep our costs – and adoption fees! – down. Social media and word of mouth! Facebook, Instagram, Twitter – talk up and photographs your foster to your heart’s content! The more exposure your foster has, the greater the chance of their perfect match seeing them. What if I need help with my foster? At CFGA, we are committed to success. We have a great team of experts, from medical to behavioral and everything in between, with years of experience and knowledge. We are always here to help our fosters – and our adopters! – through every twist and turn. Please feel free to contact us if you need any assistance. What if I fall in love with my foster and want to adopt them? While fostering should not be viewed as a fast-track to adoption, if you have fallen head over heels with your foster and would like to make them a permanent member of your family, please contact the Adoption Coordination Team within the first week to discuss. Can I take my foster to a dog park? Dog parks can be a very dangerous environment, and it is CFGA policy that foster dogs are not to be taken to a dog park. Greyhounds can get enough exercise, mental and physical stimulation through walks and play time. Dog parks can be fertile grounds for picking up intestinal parasites, fleas, ticks and bad behaviours, not to mention injuries to a greyhound that is used to running on pristinely groomed surfaces. CFGA is entirely volunteer based and operates solely on adoption fees and community or sponsor donations. Supplies and funding are always enthusiastically appreciated! To donate with cash, cheque, EMT or Interac, please contact us and we’ll be happy to help make arrangements. Volunteering for CFGA is fun and rewarding. If you have the time and interest to do something greyt, we’d look forward to hearing from you! Act as a greyhound ambassador at events, fairs, shows, etc. Whether for cross-border import, getting dogs to their foster homes or potential adopter visits, veterinary appointments… unfortunately greyhounds are terrible drivers. From time to time, we have a greyhound who needs a temporary place to stay. If you’re equipped and experienced, maybe you can dogsit for a bit!